Wingspan has begun delivering its iLoad, a portable device that copies CDs to an iPod without using a computer or requiring an Internet connection. According to the company, iLoad is fast, easy to use and all music and track information is transferred to the iPod. 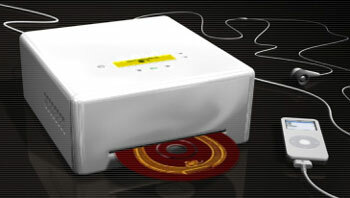 The entire CD can be copied or individual tracks can be selected to copy. You can listen to the tracks while deciding which to copy. iLoad allows convenient copy of the media to an iPod without filling up your computer’s disk space. You can also use the iLoad BackUp service, which backs up your iPod to a remote server, without a computer, through an Ethernet connection. iLoad owners get a free 2 week trial of the iLoad BackUp Service.